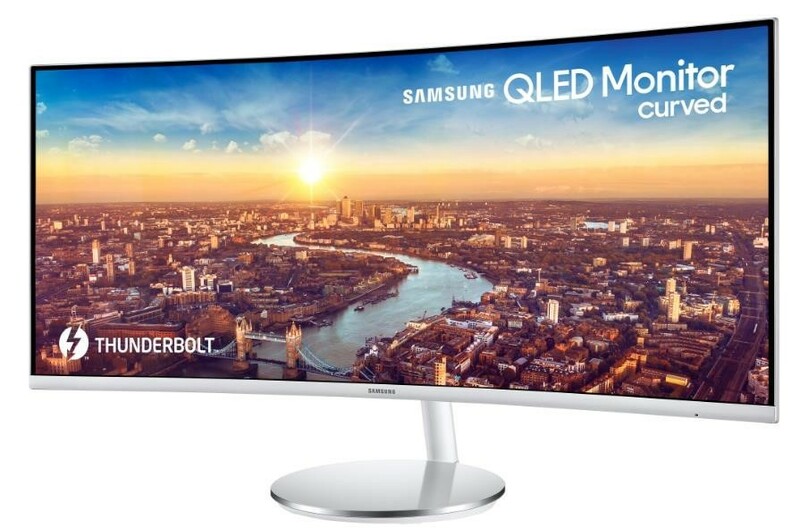 Samsung Electronics has expanded its ground-breaking curved display line-up with the debut of its new CJ79 monitor, the first curved monitor to feature Intel’s Thunderbolt™ 3 connectivity. Designed for creative and business audiences, the 34-inch CJ79 model aligns single-source power and processing speed with exceptional image quality for a comfortable and productive user experience. The CJ79 offers a clear and crisp image quality while providing a seamless dual monitor experience on a single screen. A 21:9 aspect ratio provides more screen real estate for multitasking, while a complementary 3440×1440 ultra-wide QHD resolution elevates content and imagery with nearly 2.5 times the pixel density of full HD alternatives. With the Picture-by-Picture (PBP) feature, professionals can display two sources on a single screen, and for optimal multi-tasking, the Picture-in-Picture (PIP) feature allows users to resize the second source to up to 25 percent of the screen and position it anywhere for a more readable format. Samsung’s CJ79 display incorporates Quantum Dot technology, showcasing content with brilliant and realistic detail across a 125 percent sRGB color spectrum guaranteed to entice gamers and entertainment enthusiasts. The curved VA panel technology produces a 3,000:1 contrast ratio and amplifies previously hidden details across the entire screen through pristine shades, deeper blacks and brighter whites. CJ79 is now available from participating authorised Samsung dealers at a manufacturers’ suggested retail price (MSRP) at S$1,458. Singapore – October 12, 2018 – Samsung Electronics has expanded its ground-breaking curved display line-up with the debut of its new CJ79 monitor, the first curved monitor to feature Intel’s Thunderbolt™ 3 connectivity. Designed for creative and business audiences, the 34-inch CJ79 model aligns single-source power and processing speed with exceptional image quality for a comfortable and productive user experience. Compatible with Macs and PCs, the CJ79 features two Thunderbolt™ 3 ports that transmit display, data and power at a superhero processing speed of up to 40 Gigabits per second (Gpbs) – a rate nearly four times faster than USB alternatives, and simultaneously charges devices all through a single cable. The 1,500R curved ultra-wide screen is engineered to follow the natural curve of the eye for a more immersive and comfortable viewing experience. With the height-adjustable stand and tilt functionality, CJ79 allow users to customize the positions meeting their most comfortable viewing parameters. Along with the wire-reducing ThunderboltTM 3 connectivity, the CJ79’s slim-depth and narrow-bezel design accommodates multi-display setups without sacrificing content consistency or visual appearance. The AMD FreeSync over HDMI and Display Port synchronizes the refresh rate of graphic cards for the CJ79 to reduce image tearing and stutter, providing seamless gameplay and video playback for uninterrupted viewing. The CJ79’s four milliseconds (ms) response time also ensures smooth transitions between scenes, making it ideal for racing, flight simulation and first-person battle games.